When a request is received by the portal, the profiler will map the request to a resource based on a normalized set of runtime parameters and state such as request parameters, HTTP headers, and session attributes. The Profiler is invoked during the Jetspeed request processing pipeline in the profiler valve. This valve requires that the request context is already populated with the portal request and response, capabilities, language and user information. The runtime parameters make up the profile criterion which the profiler uses to locate portal resources. The profiler works hand in hand with the Site and Page Manager components. A Profiling Rule defines a list of criteria used when evaluating a request to determine the location of a specific resource. Profiling rules are used by the profiler to generically locate portal resources based on the decoupled criteria for known portlet request data. A rule consists of an ordered list of criteria which should be applied in a given order. Following this rule's order, the profiling engine applies each criteria of the rules using a less-specific algorithm until the least specific resource criterion is considered. When all criteria are exhausted, the rule will fail and a fallback resource will be required. Resolvers are Java classes that try to match criteria to find resources. Jetspeed provides several resolvers 'out of the box'. _user Holds all user-specific pages. _role Holds all role-specific pages. _subsite-root Contains complete subsite trees, exactly like root tree. 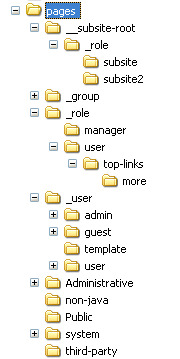 User-Role Fallback Look for page in user’s home dir, if not found, look in each role dir for the given user. Variants Path, Group Fallback, User-Role-Combo Fallback, Subsite-Roll Fallback. The profiler.xml Spring configuration file configures the profiler component. (0) JETSPEED-INF/ojb/profiler_repository.xml Holds the OJB database to POJO mapper for marshalling profile information to and from the persistent store. (1) j1 The default profiling rule. If a user does not have a profiling rule defined in the association table, this profiling rule is used. (2) ProfileResolvers (ref bean) The map of profiler resolver names to implementing resolver classes. New resolvers should be added to the ProfileResolver table.